You are a creature of comforts, and the combination of a rainy afternoon and a snuggly throw on the sofa is enough to derail your most ambitious plans to tackle the ironing or wash the dog. Give in to temptation with a cable-knit or crochet blanket throw, a herringbone toweling throw, a giant pashmina scarf, an embossed or distressed velvet throw, a quilted silk throw -- or any appealing length of finished fabric that can be folded, bunched or tossed attractively. Arrange your throw on the sofa by casually draping it over one arm, folding it lengthwise and hanging it carefully over the back, puddling it on the seat cushion, folding it into a square and setting it on the arm or among the toss pillows. While it's wrapped around you, it looks fabulous. Check that the throw looks equally fabulous by itself on the couch. Your chic sofa has gone a bit shabby, but replacing it is out of the question. Tuck a throw strategically over the seat cushion so it hides the worn areas on the cushion's edge. Casually drape a throw over one arm -- the arm the cat had mad clawful love for that weekend your MIL watched the kids. Get symmetrical and line up three folded throws at either end and in the middle of your 90-inch sofa. Hang them over the back, tuck them into the crease between the seat cushion and the back, and smooth them over the seat and the front edge of the sofa. Plop a decorative pillow at the juncture of seat cushion and back for all three throws. Now no one will see where the red wine toast -- or the darling new puppy -- left its mark at several intervals on the upholstery. Your sturdy, nondescript but well-designed sofa was perfect for your minimalist decor. Now you've gone boho, and that nubby gray fabric grates on your nerves. Transform it with throws that disguise its conservative bona fides and slip off to make room for your next decor incarnation. Wrap colorful shawls, weavings or blankets around each of the main cushions and pin them underneath, or just tuck them tightly to secure them. Don't get too crazy; match the throws or coordinate the exuberant bohemian patterns and colors. Toss two more contrasting-color throws over the arms and scatter mismatched throw pillows on the newly liberated couch. As a bonus, the throws peel off easily for washing, so you won't have to keep chasing Fido and the feline off the couch. You have a yen for the exotic, but there are already rugs layered over rugs on the floor in your safari-themed living room. A faux-leopard upholstered couch seems excessive, but a faux leopard throw on a cocoa-colored couch is acceptably divine. Whatever your opulent fancy, a faux-fur throw embellishes it in royal fashion and no animals need to be harmed in the decorating of your parlor. Use fake big game skins with African carvings, sisal carpet and kente cloth pillows. Pick up the pace in a lead-gray and white room, with ebony floors and Ghanian sculptures, with fake zebra throws on the matching gray love seats. Melt into luxury in a medieval great room with a faux lynx or mink blanket throw on the garnet velvet couch. Soften the edges of a Mid-Century Modern sofa with a fluffy sheepskin or two, artfully draped over the angular seat and spare back. 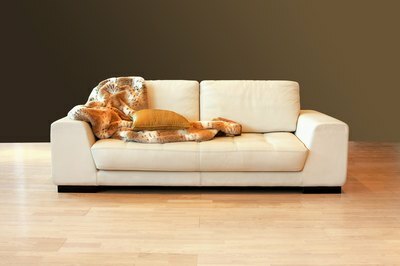 What Is a Sofa Throw?